2018 4th Annual Trivia with a TWIST! Saturday, April 7, 2018 at the Arnold Eagles Club on Jeffco Blvd! MARK YOUR CALENDARS & SAVE THE DATE! Get your tickets early! You don't want to miss this party! Each ticket includes one free raffle ticket, OPEN BAR, and TONS OF FUN!! Prizes for 1st AND last place! Table Theme Contest!! Choose your theme, dress up, use props, whatever you want! Prizes for first place team! Our Annual Trivia helps us sponsor scholarships to students with special needs and/or hardship situations! Each scholarship recipient receives a $1,000 scholarship, a new touch screen computer, backpack, $50 gas card, food cards and numerous school supplies! Help us, help students! Help us, give others HOPE! Thank you so much for visiting Cole's Hope Foundation's shop. Your purchase will help us make a difference in kid's lives who need HOPE the most. We invite you to create an account with us if you like, or shop as a guest. Either way, your shopping cart will be active until you leave the page. More items to come soon! Check back with us often!! Thank you for visiting and supporting Cole's Hope. 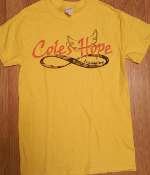 Thank you for supporting Cole's Hope Foundation. Together, we can make a difference. Together, we can change the world around us. Copyright © 2014-2019 Cole's Hope Foundation. All rights reserved.